Bogotá Needs a Congestion Fee! but not this jaguar – at least directly. During the recent oil well leak in Santander, a photo went viral of animals killed by the spill, including a jaguar. The image illustrated the spill’s deadly impacts. It turned out, however, that the jaguar had not been killed by the oil spill, but rather hit by a motor vehicle. 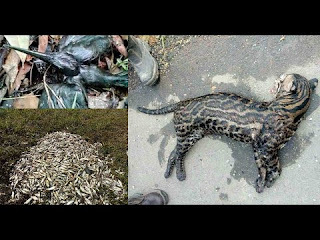 The miss-marketing of the jaguar’s death should not detract from the scale of the environmental damage from the oil spill, which killed thousands of animals, most of them fish, but also birds, amphibians and others. But in a broader sense, oil did kill the jaguar. After all, the vehicle which hit it was almost certainly oil-powered. And the road the jaguar was crossing was likely paved with oil products and built to carry oil-powered vehicles. At the same time, the deforestation caused in part by oil drilling has driven wild animals out of their traditional habitats and into conflicts with people – and their vehicles. When will Colombia escape from its oil addiction?